Tonight is Bonfire Night (Guy Fawkes) in the UK, and of course we are celebrating! 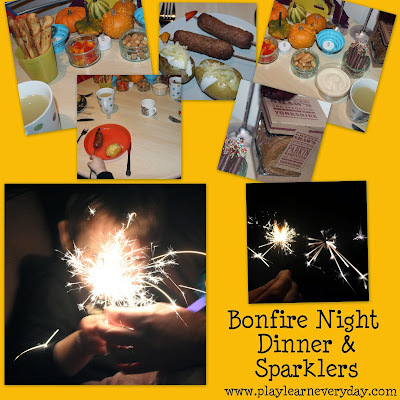 As we already went to a fireworks display on Saturday night, we just stayed in tonight and had a special themed dinner and then played with light toys and sparklers. We did have sparklers for Ethan last year, but it seemed like a new experience to him this year, learning about lighting the sparklers and being careful with fire is part of his Knowledge and Understanding of the World.